Grove City, Ohio is located in Central Ohio, just seven miles from downtown Columbus. We are a charming suburban community with a small town feel, but big city appeal. Central Ohio has so much to offer and residents enjoy a fantastic quality of life. There is so much to see and do in Grove City. There are plenty of outdoor options, including walking and biking paths, hiking trails, parks, and rivers. Grove City also boasts four golf courses, including the Pinnacle Golf Course, a Lanny Wadkins-designed PGA-pro golf course. For other entertainment options, you can go bowling, see a movie, go shopping, or hit up the casinos. You'll never be bored in Grove City! Grove City has a lot of history and heritage, which is very evident in walking around the historic Town Center. In the Town Center, you can enjoy a show at the Little Theatre Off Broadway, a history lesson at the Grove City Museum and Welcome Center, and much more. In the summer you can enjoy the Grove City summer concert series, which features many amazing musicians and bands. In addition, a brand new library will open in 2016. The Central Ohio Transit Authority has several bus lines that run in Grove City. The Evans Center, which provides services for seniors has a van that members can use. There are also free transportation options provided during certain events throughout the year. Grove City has many renowned medical facilities, including private practices, urgent care facilities, and the Mount Carmel emergency department. In 2018, Mount Carmel will open a full hospital in Grove City. In addition, Grove City is just a 10-15 minute drive from one of the best hospitals in the nation--The Ohio State University Wexner Medical Center. Jan 20.2 F° 28.3 F° 36.4 F° 2.6 "
Feb 23.3 F° 32.3 F° 41.3 F° 2.1 "
Mar 31.8 F° 42.1 F° 52.5 F° 3.0 "
Apr 40.4 F° 52.3 F° 64.2 F° 3.7 "
May 50.7 F° 62.3 F° 73.9 F° 4.3 "
Jun 59.9 F° 71.0 F° 82.2 F° 4.0 "
Jul 63.7 F° 74.7 F° 85.6 F° 4.4 "
Aug 61.6 F° 72.7 F° 83.8 F° 4.3 "
Sep 54.5 F° 66.2 F° 77.9 F° 2.9 "
Oct 43.0 F° 54.8 F° 66.5 F° 2.5 "
Nov 34.2 F° 43.5 F° 52.9 F° 3.3 "
Dec 25.4 F° 33.3 F° 41.1 F° 3.0 "
Grove City experiences all four seasons, each with their own distinct weather. The summers are humid and warm with plenty of sunshine, perfect for outdoor activities. Fall is filled with brightly colored trees and crisp weather. Winters are snowy and picturesque. In spring you will find flowering plants, but also some rainy weather. 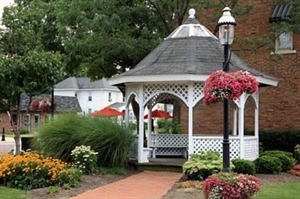 Condos Over 50 Communities Grove City has diverse housing options that will suit any need. Beautiful, tree-filled neighborhoods can be found throughout the city. Those looking for the convenience of renting can find complexes, duplexes, and condominiums across the city. Home care Senior center Visiting nurses The Evans Center in Grove City provides many essential services for seniors, including home-delivered meals, housekeeping, transportation and an emergency-response system. Evans Center members can also enjoy van/minibus transportation. There are plenty of opportunities for flexible employment and volunteering in Grove City. There are many churches and civic groups where people can volunteer their time to better the community.